The “Hound Dog” singer would have turned 84 today, had he not passed away on August 16, 1977, at just 42 years old. Elvis died at his home after suffering a cardiac arrest, said to have been brought on following his years of prescription drug abuse. However, some refuse to accept this as the truth, with rumours circulating he left a sign on his tombstone to prove he is still alive. 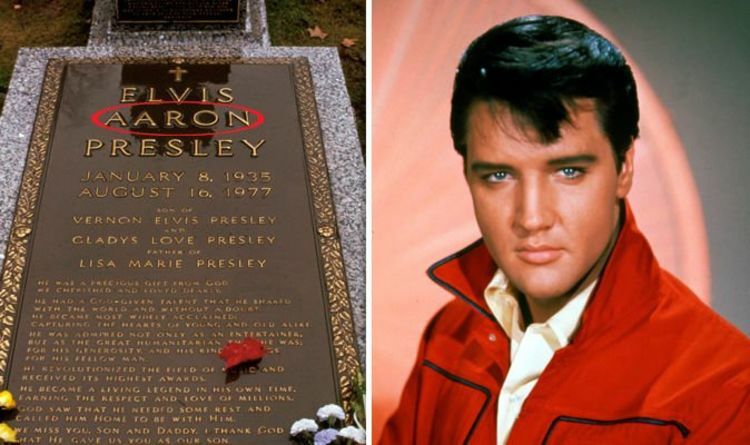 The headstone to the star's grave in Memphis, Tennessee, US, reads as follows: “Elvis Aaron Presley. However, fans have pointed out the middle name, Aaron, is not spelt correctly. They quickly pointed out his birth certificate actually spells the name “Aron”. A YouTube video was uploaded in January 2016, revealing the bombshell finding and now the same footage has gained popularity once again. One comment read: “Elvis is still alive." Yesterday, American author Gail Brewer-Giorgio made headlines after it was claimed she had a voice recording of Elvis from 1981 – four years after his death. In the tape, a man who sounds similar to Elvis says: “People ask me all the time where I’m living, and naturally I can’t say, but it’s a good place to hide. “You know I hate to think it’s going to end, but I know sometimes the secret [of being alive] has got to be let out and if it hadn’t have been for getting involved in what I'm involved in now, things and such, maybe it’d be different. Voice recognition expert L.H. Williams later claimed it was Elvis speaking.